Motorola today unveiled a raft of new Moto G smartphones. The Moto G7 range includes four all-new handsets, dubbed Moto G7, G7 Play, G7 Power, and G7 Plus. Like the Moto G6 range launched in April 2018, these new handsets offer a swathe of features typically associated with flagship smartphones – for an impulse-buy price tag. It's a business model which has proved impossibly successful for Motorola. Since it introduced the Moto G line a little over five years ago, Motorola has shifted more than 70 million devices worldwide. This plucky little smartphone has a lot to prove. The Moto G range faces more competition than ever before thanks to the ever-increasing number of Chinese manufacturers offering the same premium build at a reduced cost. Most notably, Honor – with its new logo still smelling of fresh paint – is one of the most popular brands in affordable smartphones. The Honor 8X falls slap-bang in the same price bracket as the Moto G6, offering a similar all-screen design with a small notch at the top of the display, dual-rear camera, and 4GB of RAM. If you weren't aware of the price tag, you could easily be forgiven for thinking that the Moto G6 is a much, much pricier smartphone. The curved Gorilla Glass rear case feels solid and makes the 176g handset a joy to hold. It can be a little slippery, but that's to be expected with most modern glass-centric smartphones. And if it does get a little too much, Motorola helpfully includes a plastic protective case in the box. Like the Honor 8X, Motorola has decided not to jettison the trusty 3.5mm headphone port, so you won't need to use a dongle to keep using your old wired cans. Although, if you do own a pair of USB-C headphones, there is a port available. It also handles syncing and fast-charging using the TurboPower wall plug included in the box which promises nine hours of battery life from a quick 15-minute charge. The front of the Moto G7 is dominated by the expansive 6.2-inch "Max Vision" display, which boasts a Full HD+ resolution and a 19:9 aspect ratio for a widescreen viewing experience with movies and games. 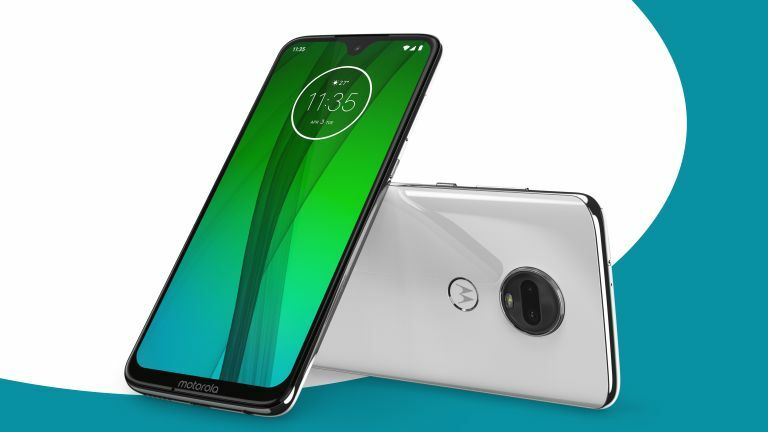 To squeeze that amount of screen real estate into a device that remains comfortable to use one-handed, Motorola has opted for a notch at the top of the display to house the front-facing 8MP camera, speaker grill, and various sensors. If you're not already sold on the notch aesthetic, there's little here that's going to sway you. However, the screen is sharp, colourful and bright – even in direct sunlight. Moto G7 has a dual-camera packed with AI features, including "Smile Detection" that automatically hits the shutter button when the phone detects that everyone in the frame is grinning sufficiently wide. The primary lens is a 12MP sensor, while the secondary is a 5MP depth sensor used to add artificial bokeh-style blur behind the subjects of portrait photographs. During our brief time with the Moto G7, the portrait mode seems to work well enough, with a nice crisp subject in the foreground and a subtle blur applied to the background. Granted, this is no Pixel 3, but then again – it's almost a third of the price. Like the Honor 8X, the Moto G7 is capable of shooting portrait mode shots from the selfie camera, too. However, unlike the former, Motorola is not relying on a secondary lens, but using software to determine what needs to be blurred. Below the dual-camera is the circular fingerprint scanner. It's slightly recessed into the rear case which makes it impossibly easy to find. In our tests, it was fast and accurate authenticating our fingertip and opening the device. Motorola says the Moto G7 is "water repellent", but falls short of being able to survive a full-on submersion. If you're planning on shooting videos of friends and family in the swimming pool or sea, this probably isn't the smartphone for you. However, the Moto G7 should be able to withstand use in the rain, and maybe even an accidental spill, or two. Moto G7 ships with 64GB of in-built internal storage, which should be more than enough for your apps, photos and videos. If it's not, there's an option to expand the storage via microSD card up to 512GB. The Motorola Moto G7 will be available for £239 exclusively on Amazon when it launches on March 1, 2019 in the UK.